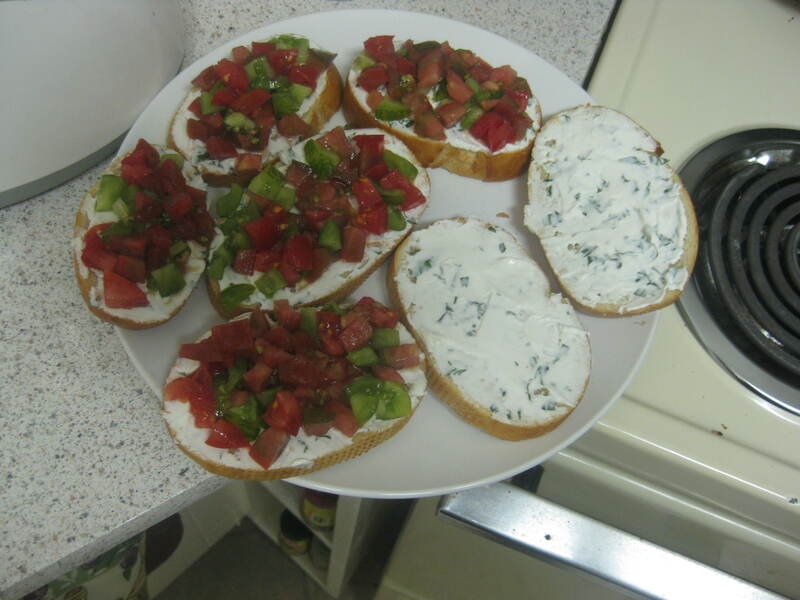 One of my favorite appetizers is using our heirloom tomatoes and basil from the garden and make a modified bruschetta with goat cheese. You will need a loaf of french bread or sour dough, some heirloom tomatoes, basil, and goat cheese. It’s a pretty easy recipe. 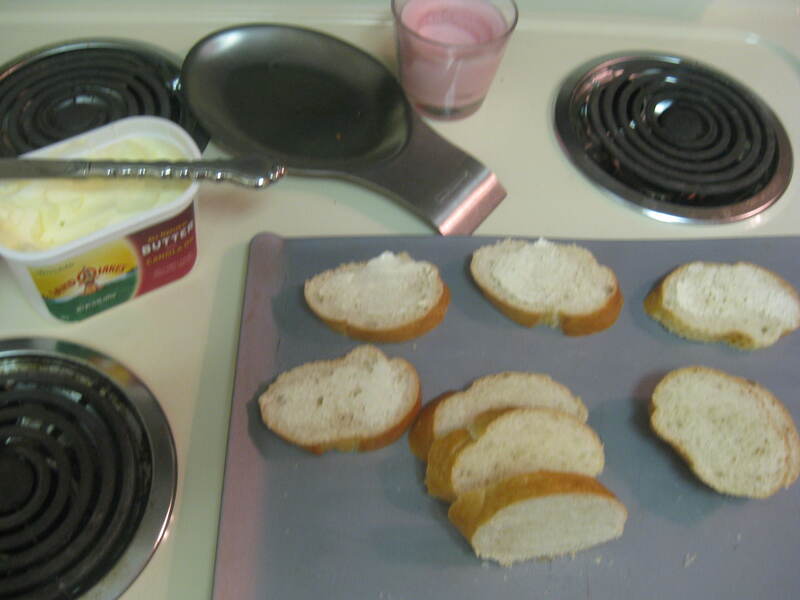 You cut the bread into small slices and butter each side and bake at 400 for 4-5 on each side. 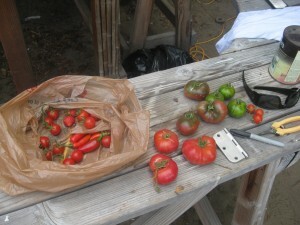 The picture above is of the tomatoes we used. Using home grown tomatoes in this recipe really makes this taste superb. 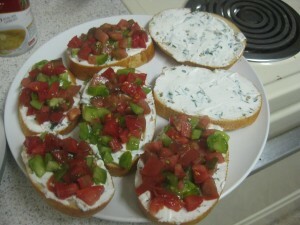 We have used grocery store tomatoes (trader joes heirlooms) and they just don’t compare. To the left is a green zebra diced up into small pieces. 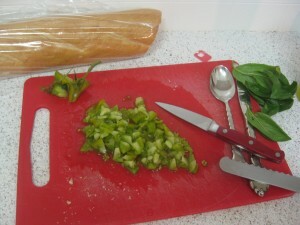 The basil leaves are to the right and still need to be minced. You will be blending the cream cheese with the basil and spreading it on the bread, so the finer the better. Last Wednesday Aidan went to one of the farms that I use at the restaurant. 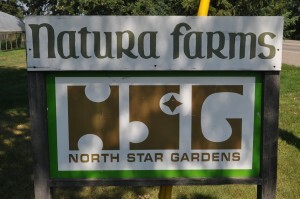 The name of the farm is Natura Farms. They practice all organic farming. 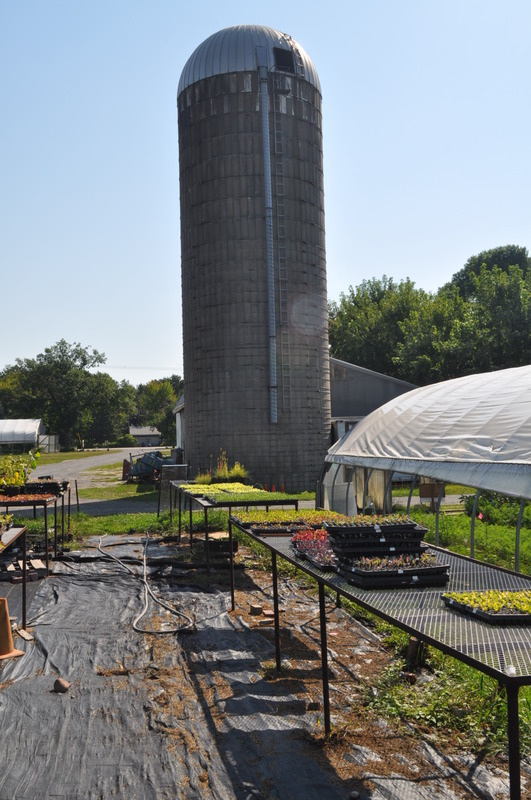 However, they can not afford to be certified by the Federal Government to be USDA organic. There produce is out of this world!! The farm is about 57 acres and they grow just about everything. 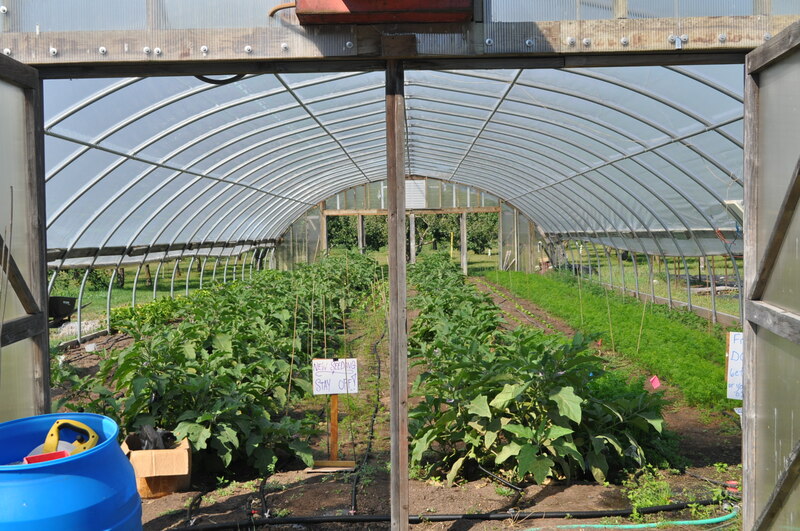 On the property they have three green houses where they start seeds before they transfer to the fields. Out in the fields we found all sorts of different kinds of greens, gourds, and peppers. 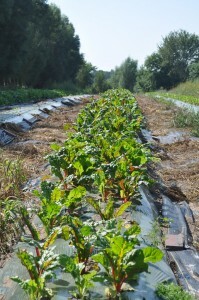 They also have to huge patches of strawberries and raspberries. 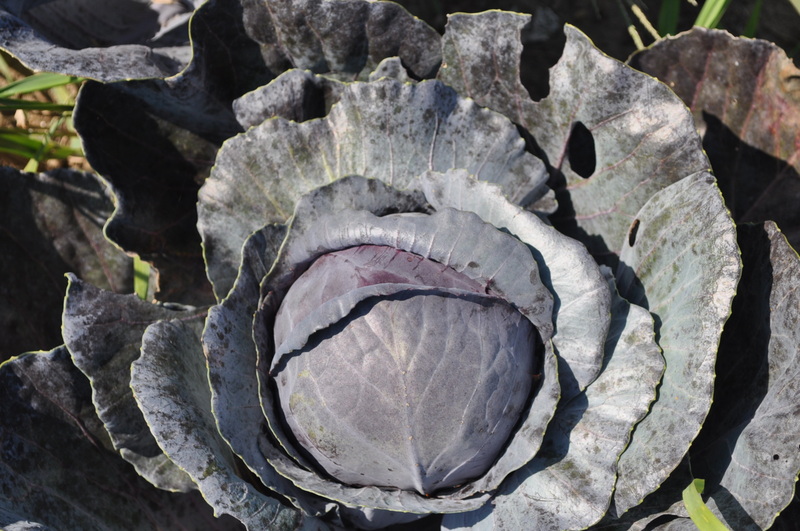 Here are some pictures of the produce we saw. It was fun! This row of swiss chard is grown under black plastic. 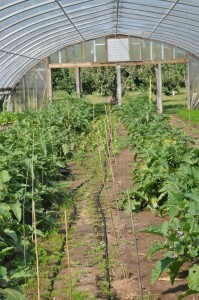 They run hoses under the plastic in the spring to water through out the summer. It helps with controlling the weeds. 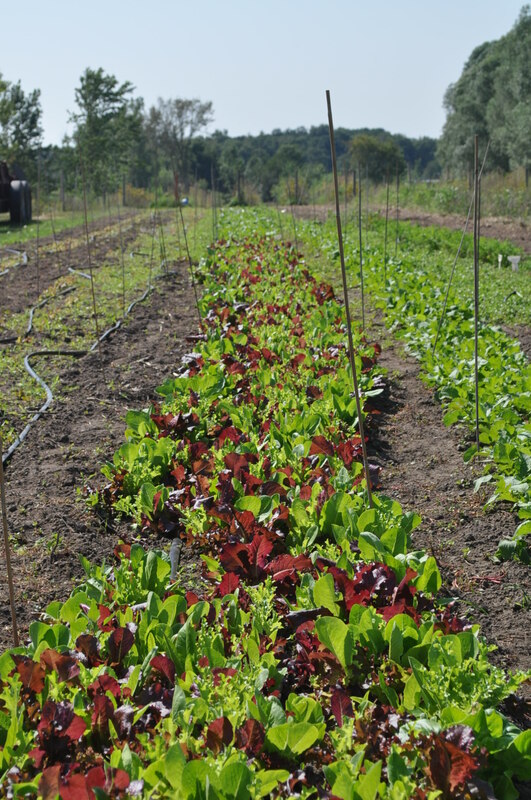 Mixed and greens and lettuces seems to go on for ever. 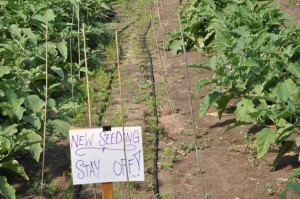 For insect control they plant a wide range of items which welcomes good insects to eat the bad ones. 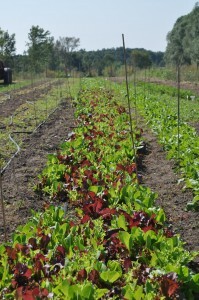 The red cabbage row is as long as the greens in the previous pictures. We had and great time learned a lot plus we got to pick any fresh vegetables we wanted for free!! 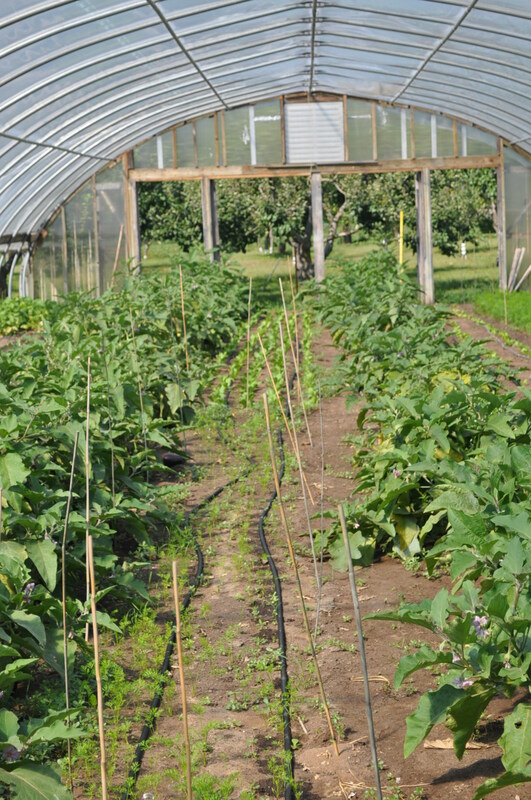 Stay tuned for recipes from the farm.